Are you looking for the best solar backpack to keep all your mobile devices charged while camping or hiking in the great outdoors? Read on to learn more about solar panel backpacks on the market today and probably find one that suits your style, charging needs, and budget. The smartphone and other mobile devices have revolutionized the way we communicate and stay in touch with family, colleagues today. You can hardly venture out of the house without your smartphone within reach. The tragedy is that smartphone batteries hardly last a day without charging. The device is not of much use without a power outlet close by. This is a major problem if you are traveling, biking, or hiking in remote locations. You’ll need a reliable way to keep your smartphone and other devices such as your tablet and laptop charged at all times. This is exactly what a solar backpack does. The solar backpack is a portable charging station conveniently located on your backpack. It converts solar power into direct current (DC) energy that charges your mobile devices. It is a great tool to have around when your device is running out of juice and the nearest power outlet is miles away. If you are walking under the sun why not let Mother Nature save you from a dead phone battery situation? In this age of information and wireless connectivity, almost everyone uses a cell phone, tablet, iPod, laptop, portable speakers, and other electronic devices. All these devices need to be charged constantly to keep on working as expected. Unfortunately, we are not always near a power outlet every time. The solar backpack solves this problem by providing you with a portable charging station that you can use wherever and whenever there is sunshine, which is most of the times unless you live in the polar regions. The solar pack is basically your normal backpack but with a solar panel attached. The panel provides a convenient way to charge your devices using energy from the sun. You can even charge a battery pack during the day and use it to power your devices at night. You may ask, why not carry a power bank and charge your devices wherever you are? Well, in my experience, power banks do provide additional and easily portable sources of power but they too have a limit. You need to be extremely careful of how you use your devices if you are solely relying on a power bank. This is not the case with solar packs. It eliminates all worries and concerns about your device running out of juice. The best solar power backpack also comes with a hydration pack included. A hydration pack is something you should never leave the house without when going for a hiking, biking, or any other backpacking trip. When you are on a backpacking adventure and need a convenient way to charge your devices. Attending weekend festivals? The last thing you need at a festival is your camera or phone suddenly dying on you. A solar backpack ensures this tragedy doesn’t happen. While you are out camping and need to stay in communication with people back at home. The solar pack keeps your devices fully charged whether you are in or away from the campsite. When you go out fishing and need to have your cell phone and other devices charged. You can always carry one of these handy solar packs in your car just in case you are stuck in the woods or run into an emergency situation away from home. The car’s charging system may fail to leave you without any other option except your solar panels on your backpack. The weight of the pack is an important thing to check especially if you plan to go on a long hike. A heavier solar backpack will do for short day hikes because you’ll not be carrying a lot of heavy gear such as food and sleeping bags. However, the weight of the backpack becomes an issue if you are going for a long hike or an overnight trek. I recommend getting the lightest solar backpack you can get unless the additional weight is used to provide more volume or solar power. One of the key distinguishing factors of solar packs is their solar power capacity. This is what makes sola packs different from other backpacks. The right solar capacity of a backpack will largely depend on your needs for electric power to charge your devices. There are solar packs that provide enough power to charge your smartphone while others provide more power to charge multiple devices including your DSLR camera, GPS unit, laptop, and tablet. Remember to check the backpack’s voltage specification and ensure the voltage is either equal or greater than the power needs of your electronic devices. For example, most USB devices require 5V to charge sufficiently so go for a solar backpack with the 5V specification or more. You obviously want to invest your money in a durable backpack. 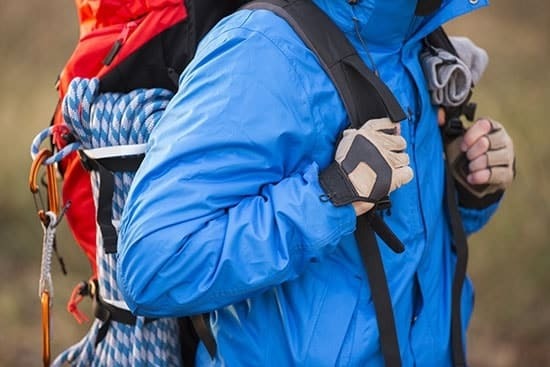 If you plan to go hiking or camping in the backcountry, get a well-built backpack that can withstand punishment from the elements. Check the materials used in its construction. I personally recommend nylon because it is water-resistant, tough, and lasts long. You can choose any other tough material but make sure the seams where the straps connect with the backpack are triple stitched to prevent tearing. The solar panels used in the backpack should also be tough and flexible to avoid being damaged by elements. Keep in mind the panels will be exposed to the sun and possibly rain or snow. Most solar packs come with a hydration bladder to help you carry enough water without the hassle of sticking bottles inside the pack or on the sides. A solar pack with a hydration bladder is highly recommended, especially when you plan to stay out in the wild for a whole day or longer. A good solar pack should ideally have a 2-liter bladder. This will be enough water to keep you hydrated for a whole day. The cost of the solar backpack is another important consideration when purchasing outdoor gear. Solar backpacks come in different price points depending on size and other key features. The best solar pack will feature better quality, less weight, and increased durability but may come at a higher price. However, you don’t have to spend way above your budget in a solar pack with features that you’ll hardly use. There are smaller solar backpacks for people who go on short hikes and probably just need to charge a smartphone only. If you are a serious camper or hiker planning to spend a lot of time outdoors, I recommend going for the best and most durable solar backpack you can lay your hands on. Consider it as an investment or money well spent. Otherwise, stick to your budget and find the best pack you can get within that budget. You may like: Top 5 pop-up campers for adventure trips. Here is a review of my top 10 solar backpacks. These reviews will give you an idea of the best solar power backpack on the market. The Voltaic Systems OffGrid solar pack is designed to help you charge your mobile devices on the go wherever you are. It delivers 10 Watts of solar power, which is enough to power your smartphone, tablets, DSLR camera, and any other USB device. It comes with a battery pack or Power Bank included. The solar pack’s panel is made of high-quality SunPower solar cells with 22% efficiency. It is water-proof and UV resistant. Its ETFE coating makes it more durable than most solar panels on the market today. The included V44 battery pack can charge your devices for 7 hours when connected directly to the solar panel and 6 hours via the included USB cable. High-efficiency SunPower solar panels. They can charge your devices just as fast as your power outlet at home. The solar panels are made of top grade monocrystalline solar cells. 12,000mAh battery pack. It has two USB ports which can charge two mobile devices at the same time. Dedicated pockets. They make it possible to charge your smartphone and other devices on the go. Padded sleeve. The sleeve can hold your laptop or tablet safely. Great design. For the ultimate comfort, the backpack is designed with a high density molded back and breathable mesh shoulder section. Pricey compared with other solar backpacks but with more features and higher efficiency than the rest. It provides value for money. The Birksun comes in a beautiful combination of black and festival pink colors. It not only keeps your devices charged at all times but looks great to carry along to the beach, backpacking adventures, and festivals. It is lightweight at just 2.4 pounds and has an ample volume of 20 liters. It gives you fast charging using the latest solar panel technology. High-quality water-resistant fabric. This way your solar pack will work even if it falls on water. Lightweight, waterproof, and extremely durable solar panels. They will work for a longer time than other similar solar panels. TSA approved. You can take your solar pack with you both for local and international travel uses. Dedicated laptop sleeve. The sleeve can hold a 17-inch laptop securely. Built-in 3,000mAh Lithium-Ion battery. This battery can charge most USB devices. It is a 3.25watt monocrystalline battery capable of charging an USB device at the same speed as a wall socket power outlet at home. Fast charging. It is capable of creating power that can charge your devices with just two minutes of sunlight exposure. It has a better efficiency ratio than an ordinary solar panel device. Many pockets. The bag has more pockets to keep your small gadgets safe and secure. Doesn’t have a bulky appearance with 16x12x15 inches dimensions. This ECEEN solar backpack comes with 7 solar panel walls that provide enough power to charge your smartphone, tablet, eReaders, GoPro Camera, GPS, and Bluetooth speakers. It is the most versatile solar hiking daypack. It features a 3.25 watts charger to keep your mobile devices powered at all times. It is not only ultra-lightweight but made of waterproof and tear-resistant fabric. It is a flexible backpack that you can also use for daily activities. The backpack comes with a 3.25 watts solar charger complete with a built-in battery. Can charge a wide range of devices from the 5V USB port including smartphones, tablets, laptops, GPS units, eReaders, Bluetooth speakers, and GoPro cameras among others. The solar charger is powered by high-efficiency 7 watts SunPower solar cells with 22% power transfer efficiency. Solar cells have a protective anti-scratch coating and enclosed in durable weather resistant PVC fabric. It is a perfect solar pack for the outdoor person who spends a long time outside the house or office. Many pockets. Has plenty of pockets and compartments to stuff your gear. A bit pricey but with awesome features and functions. Provides great value for money. The red colored ECEEN camping backpack is a 7 watts solar powered camping backpack made of high-quality poly materials. It is designed to carry your essential outdoor gear and provide enough solar power to charge smartphones and other 5 volt mobile devices you carry along on your outdoor adventures. It features SunPower brand solar panel cells with a high-efficiency transfer rate of 22 percent. The bag has an ample size of 20.5 x 13.8 x 8.6 inches. It is a great solar charger for camping, music festivals, biking, hiking, and other outdoor activities. Fast charging. Takes between 6 and 8 hours to fully charge a smartphone or tablet, depending on the device model and battery size. Removable 7 watts lightweight solar panel capable of charging your smartphone, laptop, tablet, camera, and other 5 V devices. Great design. Rich pocket design that allows you to securely store your gear. It has a soft padded laptop pocket that can accommodate a 14-inch laptop. Huge capacity of 36 liters. It weighs just 2 pounds including the solar panel. Good warranty. Comes with an 18 months warranty and 30-day money back guarantee from the manufacturer. It no longer comes with a battery pack included. This is another durable Birksun Solar Backpack that is available in sleek Mythos black color. It uses the latest solar panel technology to give you chargeable power in just two minutes of exposure to sunlight. You can charge a completely dead battery using this 2-minute power by 1%. The solar charger in this backpack has better efficiency ratio than ordinary solar panel devices. It is ranked high in most Birksun solar backpack reviews. Premium materials. High-quality construction that the Birksun brand is well known for. The backpack is constructed using soft and durable fabric for comfort and protection of your delicate devices such as smartphones, tablets, cameras, and laptops. Extra pocket. Comes with a soft and secure fleece lined sleeve to hold your laptop. The laptop pocket can securely hold a 17-inch laptop. It has one USB port which means it can only charge one device at a time. The ECEEN Solar Bag comes with a 7-watt solar panel that you can use to charge your smartphone, tablet, laptop, GoPro camera, and other 5V chargeable devices. It gives you unlimited power to charge your devices on the go. It is designed to capture a greater amount of sunlight than most solar panels to give you more electricity from each panel. The backpack is made of high quality and durable nylon fabric. It has many pockets and compartments to hold your gear. It is a perfect solar back for backpacking, biking, hiking, mountaineering, fishing, festivals, and other outdoor activities. High-efficiency. It has high-efficiency 7 watts SunPower solar cells with a transfer efficiency of 22%. The cells use the latest solar technology to ensure that your devices are fully charged at all times. Protective coating. The cells are enclosed in a protective anti-scratch coating and sewn in durable weather resistant PVC fabric. It can charge a wide range of devices via the USB port including smartphones, GPS systems, Bluetooth speakers, MP3 players, tablets, laptops, external battery packs, and many more. Lightweight and extremely durable. The backpack is made of rip-resistant and waterproof fabric with stress points reinforced using bar tacking for longevity. The small flaps holding the solar panels seem to be poorly made but are strong enough to hold the panels securely. This solar charger from SunLabz is an excellent product made from durable waterproof fabric. It is one of the best solar backpack which is designed for the harsh outdoors. As for solar energy, the backpack comes with 7W solar panel cells and a powerful 10,000mAh power bank (battery pack). It is a 5V USB charger and a travel backpack that is roomy enough to accommodate all your essentials. To keep you well hydrated, the Solar Charger backpack has a 1.8-liter hydration bladder. It has a beautiful ergonomic design and a number of pockets and compartments to store your essential outdoor ear items. Durable solar panel. Has a durable, lightweight anti-scratch solar panel. The panel is held by a weather resistant PVC fabric that can withstand abuse from outdoor elements. Large panel. It packs 7W of solar energy to keep your mobile devices charged while you are hiking, camping, biking, or enjoying long hours of outdoor air. Hydration pack. The backpack has a 1.8-liter hydration pack that eliminates the need to carry along bottles of water. Quality materials. Made of sports quality PVC fabric that is not only weatherproof but extremely durable too. The EnerPlex Packr Commuter Solar backpack has a special design featuring several compartments and pockets as well as a flexible solar panel conveniently located at the back to absorb as much sunlight as possible. It has a small battery inside that can charge your tablet, camera, or smartphone via a USB port. The 3-Watts solar panel delivers 5 volts of charging power directly from the sun. It is a relatively smaller solar backpack but capable of keeping all your mobile devices charged on the go. Extra pockets. 2 main pockets and two side pockets which include a 15-inch laptop compartment. It has other smaller pockets to store other little items such a computer mouse or a power cable. The ECEEN Hydration Solar Backpack is a great option for any hiker, backpacker, or camper who loves being self-sufficient. It is a backpack that doubles up as a reliable solar power charging station with a powerful 7 Watt solar panel charger. The backpack also includes a large 2-liter water bladder to keep you hydrated as you tackle the wild outdoors. It is a stylish red backpack that hangs comfortably on your back without wearing you out. ECEEN hydration solar pack. It keeps you connected when you are traveling off the power grid. It can charge a wide range of mobile devices including your smartphone, tablet, GPS unit, DSLR camera, iPod and much more thanks to its 5V USB port and high-efficiency solar cells with a transfer rate of 22%. Protective Voltage Stability Control. This feature safeguards your devices from damages caused by unstable currents. Removable solar panels. They can be removed to allow you to use the backpack as a normal bag. The SolarGoPck is a solar-powered backpack with a large battery and solar panel. It comes in a stylish combination of black and blue colors. It comes with a reliable 5W solar panel that provides sufficient power to charge your mobile devices. Besides the 5W solar panel, the backpack has a powerful 12,000mAh battery pack, the highest battery capacity for solar backpacks in its class. It is a roomy backpack with 27 liters of space to accommodate everything you need while hiking, camping, or attending a festival. Durable waterproof materials. It will last longer if you take good care of it when not in use. Powerful enough to charge any mobile device. The removable 5-watt uses the latest solar panel technology to keep your devices fully charged at home and away. Powerful 12,000mAh Li-Ion battery pack. This serves as an additional power source. Spacious 27-liter backpack. It can carry most of the stuff you need on an overnight trekking adventure or when attending a festival. Q. How do solar panels in a backpack work? A. The solar panels on a solar backpack work in the same way domestic solar panels at homework. They simply convert solar energy from sunlight into Direct Current that can be used to charge your mobile devices when you don’t have a regular wall socket power outlet close by. Q. How much time does a solar panel on your backpack take to fully charge a smartphone? A. The time it takes to completely charge a smartphone using a solar backpack depends on many factors such as the smartphone model, its battery size, and the capacity of the solar panel. However, for most smartphones, charging using solar backpack panels takes between 6 and 8 hours. Q. Can you replace the battery pack on a solar backpack with a more powerful one? A. Most solar backpacks come with built-in battery packs, which make it impossible to replace the battery or power bank. Fortunately, most of the models we have reviewed above come with powerful battery packs, some with as much as 10,000mAh capacities. In most cases, you won’t need to replace the battery pack. Q. What is the best water hydration bladder size in a solar backpack? A. You obviously need as much water as you can carry in a solar backpack’s hydration bladder but keep in mind the more water you load into the pack the heavier it becomes. To find a good balance between hydration and weight, it is recommended to go for a backpack with a hydration bladder of 1.8 to 2 liters. That’s enough water to keep you hydrated throughout the day without having to carry too much weight. Q. What is the best construction material for a solar backpack? A. Solar backpacks are designed using a combination of many materials including nylon and PVC. I recommend nylon because it is not only waterproof but durable too. A solar backpack gives you the best opportunity to use Mother Nature to charge your mobile devices when you are away from the local power grid. It is a convenient way of using clean green energy to stay connected with family and friends. When shopping for the best solar pack, make sure to check its weight, solar power capacity, and size. The ten best solar backpacks we have covered in this review provide reliable charging power and are amply sized to carry your essential camping or hiking accessories. Find one that meets your device charging needs and budget.